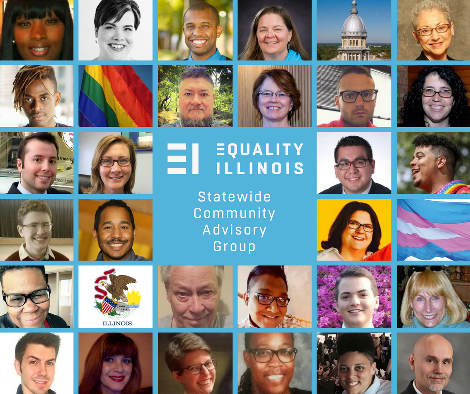 CHICAGO (December 5, 2016) – Equality Illinois on Monday announced the formation of its Community Advisory Group consisting of a diverse representation from 28 LGBTQ individuals and allies from across the state who will advise Equality Illinois in the policy development and agenda building necessary to secure and advance LGBTQ equality, social justice, and intersectional action in Illinois. “We are thrilled to begin working with our inaugural Community Advisory Group,” said Mike Ziri, Director of Public Policy at Equality Illinois, the statewide LGBTQ civil rights organization. The idea for the Equality Illinois Community Advisory Group grew out of the statewide listening tour conducted over the summer by Equality Illinois CEO Brian C. Johnson, during which he visited 12 communities and listened to stories shared by more than 200 LGBTQ people and allies. Advisory Group members include a high school senior in Springfield; a recent immigrant from Nairobi, Kenya; college teachers from Herrin, Champaign, Jacksonville, and Chicago; local LGBTQ organization leaders in Springfield, Bloomington-Normal, Peoria, Carbondale, and Chicago; a college student in Charleston; a faith leader in Peoria; government and business people; the parent of a transgender daughter in Palatine; and community activists from many cities. Read about each member of the Community Advisory Group at www.equalityillinois.org/ei-advisory-group/ei-advisory-group-bios. Earlier this fall Equality Illinois called on interested stakeholders to apply for positions on the panel. Group members serve for about a year, but they may re-apply for a second year of membership.